Multiple student organisations, youth organisation, trade unions and civil society members demonstrated at Jantar Mantar in Delhi, demanding the withdrawal of the Citizenship (Amendment) Bill and the sedition charges against Hiren Gohain, Akhil Gogoi, Manjit Mahanta and others. The activists were arrested post a January 7 meeting which was organised by the Save Assam forum in the heart of Guwahati, which was attended by eminent citizens including former Assam DGP Harekrishna Deka, former CMs Prafulla Mahanta and Tarun Gogoi, and several activists. In the video footage of Gohain’s speech, he says, “If no one listens to us, the government, the state and political parties, then it’s a different thing, then we will definitely be compelled to raise the demand for an independent Assam. But let’s not get carried away by temporary emotions, as citizens of India, we will fight democratically as long as we can. If that fight is not successful, then the demand for independence will come up”. 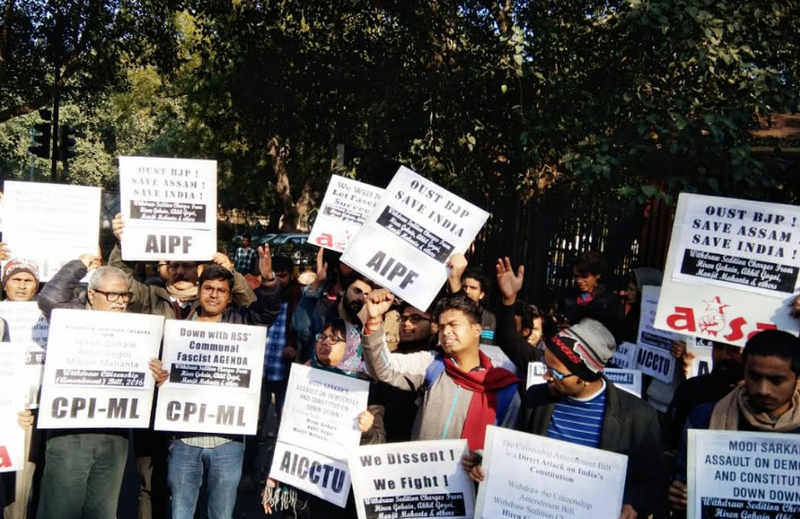 With protests against the Citizenship (Amendment) Bill intensifying, organisations like AISA, RYA, AIPF, AICCTU, United Against Hate, CPIM- ML and other individuals took part in the protest. Niraj Kumar, general secretary of the Revolutionary Youth Association conducted the proceedings.